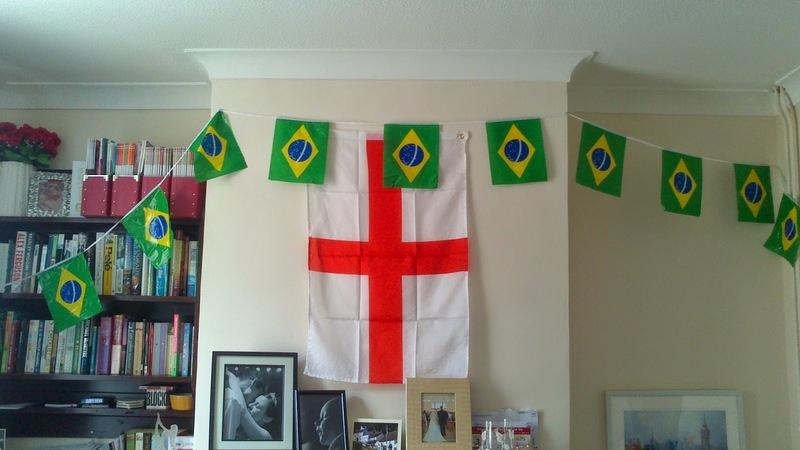 Emily Davies Writes: How World Cup 2014 can IMPROVE your marriage! How World Cup 2014 can IMPROVE your marriage! "Over the next month, Jon, you can watch as much football as you like!" What are you saying? Think about what you're saying, you mad woman!... however, if you're serious about that, you are the best wife that ever lived. Jon had a big grin on his face. He had arrived home to a patriotic England flag above the fireplace, Brazilian flag bunting strung up around the lounge, a nice cold cider, some chips and salsa, popcorn, the lot. World Cup 2014 had arrived in the Davies household! Yup, you are the best wife in the world! Aside from the festive decorations I had picked up in Asda, I had also embarked on a bit of footballing nostalgia on the behalf of my dear husband. I had bought him an official Panini World Cup 2014 Sticker book. Complete with five extra packs of stickers. Woah, slow down, how can you ever top this amazing gift of generosity, nostalgia and general football geekery! Jon rushed to the dining table, tore open the shiny packaging, devoured the packs of stickers as he began turning the pages and gently, oh so carefully, placing each sticker in its rightful place. Oh the fun, we will have! Some might believe this to be marital suicide. Some might think that this amazing act of selflessness came with no strings attached and the result would be a couch potato football hooligan, hogging the remote and sofa for the next six weeks and refusing to carry out any tasks unless they neatly fit into a 15 minute half time slot. I can inform you that I now have the most productive, helpful husband in the world. In fact, he's now begging me for chores around the house! 1. You can watch unlimited football until the World Cup Final... as long as you do the washing up every day. The washing up is a constant source of frustration in our kitchen. My eczema means that it's actually really painful if I do it myself and it causes a huge eczema flare up, this means my husband forbids me from doing it, but it doesn't always mean that it's done when I want it done. If my husband washes up every single day, leaving me a clean kitchen with clean pots and pans, then I am quite happy to cook every day, meaning that he can watch the football. If he was expecting me to cook in a dirty kitchen while he watched the football then this would be a surefire recipe for disaster! 2. You can watch unlimited football until the World Cup Final... as long as you put Ruby to bed every single night. If Jon commits to doing Ruby's bedtime it first of all means he continues to take an active role in her life while the World Cup is on. Secondly, it gives me a break meaning that I don't resent him for watching football while I'm struggling with Ruby after having looked after her all day. It also means I have a few minutes to set myself up to be productive after she's gone to bed, without being distracted by the TV. Bring on the lists! Yup, there are rewards to be had! Jon can only gain more stickers for his sticker album if he performs tasks around the house. Mowing the lawn on Saturday morning garnered him three packs of stickers. Changing his address with his credit card company, one extra pack. Daily tasks (like the washing up) and parenting tasks don't count (Jon shouldn't - and doesn't - need any encouragement to look after his own daughter!) but administrative tasks that would otherwise take weeks to get round to, they can be completed in minutes if there's a packet of stickers to be had. You see, two weeks ago we moved house. There's still a lot to be done. That Christmas Tree that's still on the dining room floor? Put it up the loft and I'll give you two packs of stickers. Changing your address with the bank - one pack. Sorting through your wardrobe... hmmm that's got to be worth five packs! And you know what? I'm starting to quite like this system! Jon is a footballing freak and at times like this, I am the definition of a footballing widow. There was no way he was going to let World Cup 2014 pass us by. And why should he? It's something he's passionate about and it only happens once every four years. So I had to concede defeat before it had even started - why argue about the inevitable? Instead, let's embrace the football! Embrace my husband's one big passion in life. Get involved! Make it fun, and use it to my advantage. Over the last few days I've had the most attentive, most productive, most helpful husband in the world, and despite his football addiction, I love him more than ever! 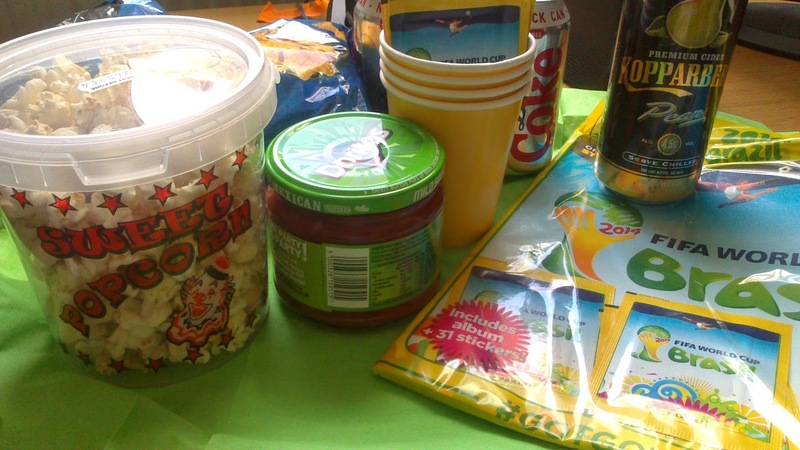 How are you making World Cup 2014 work in your house? Way to go Emily. A brilliant idea and one that works for a whole host of sporting events. Is it our Human Right to a have a holiday?